It has the innocent look of any other toaster, a silver finish with some basic buttons. The real surprise comes after the toast pops up. Your morning toast can feature four different imprints, a smiley face, birthday cake, sunshine, or coffee cup. All it does is leave a heat imprint on the toast (it sounds so fancy!). Don’t think you can get those cute little imprints on waffles or bagels, for those, the plates (which hold the image) must be removed; it’ll be a bummer when your little daughter is looking forward to a little sunshine on her toast but ends up with a plain looking piece, with the crust probably on too, jut because you forgot to put the plates back in! While this toaster has no awesome qualities, other than the imprints, it still costs $60. If you’re a real sucker, you’ll spring for the $15 “holiday” pack of plates – you get a snowman, a Santa, a snowflake, and a tree (no menorahs, sorry!) Sure, it’s not as cool as the roller toaster, but that one doesn’t give you any snowmen or sunshine images on your toast. And it even has cancel, reheat, and heat settings, talk about quality. 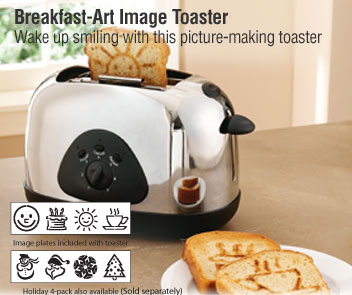 Get your Breakfast-Art Image Toaster from the most practical retailer on the planet, Brookstone.